Well, it finally happened. The Fed announced today that it will start reducing its Quantitative Easing (QE3) program by tapering the bond purchases from $85 to $75 billion a month, starting in January 2014. 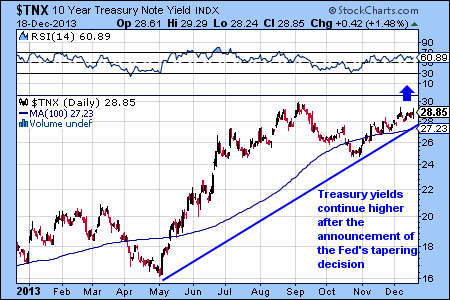 The Fed also reassured investors that it will keep interest rates low for the foreseeable future. The stock market reacted positively: the Fidelity Spartan 500 Index Fund made a new all-time high today and almost all equity funds closed up. The notable exception is the gold mining sector that continues its bear market. The announcement pushed the yield on the 10–year treasuries higher, which in turn caused the Fidelity Spartan Long-Term Treasury Bond Fund (FLBIX) to go lower. We would continue to avoid investing in FLBIX until this long-term trend reverses. The stock market reacted positively to a better-than-expected job report today with all major indexes closing higher. The rally came as a relief after days of selling in both global and U.S. markets. The market leading investments for the first six months of 2013 were Japanese stocks and the U.S. biotechnology sector. Now, as the summer gets under way, new sectors are emerging with the potential to take over market leadership. The newly emerging sectors with increasing momentum include the automotive, health care, brokerage, defense, insurance, retailing and consumer discretionary sectors. We’ll be tracking the corresponding Fidelity Select funds closely for the next few weeks for early signs of the summer rally. The stock market has dropped in panic selling in the last two days and is approaching the support level (see FUSEX chart below). Our best hope is that short sellers will cover their positions ahead of the weekend, which will lead the market higher while reinforcing the support level. The selling of equities today was ferocious, reminiscent of the worst days of 2008. Energy services stocks got hit especially hard (see FSESX below). This was part of the global sell-off of commodity-related investments (see FFGCX below). Money flow: Where is the bull market now? 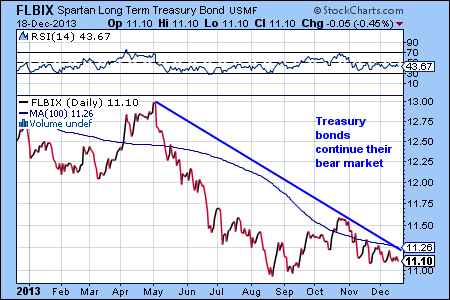 While the stock market selling continues, the bull market in treasury bonds accelerates. The U.S. stock market indeces bounced back from their support level in the last few trading sessions, however the momentum is not very strong and the volume is light. The overall trend continues to be bearish until FUSEX moves above the trendline. The Fidelity Spartan 500 Index fund (FUSEX). As gold moving higher again reversing its recent pullback, gold stocks moved up to their resistance level. A breakout on high volume from this level would be considered very bullish. The Fidelity Select Gold fund (FSAGX) has approached the top of its trading range. In our blog post three days ago we said that we wouldn’t be surprised to see the selling continued. On Thursday and Friday the stock market sold off on higher than average volume. Unfortunately, the stock market is increasingly in a panic mode with brokers reporting a spike in trading volume, as individual investors sell their stocks. 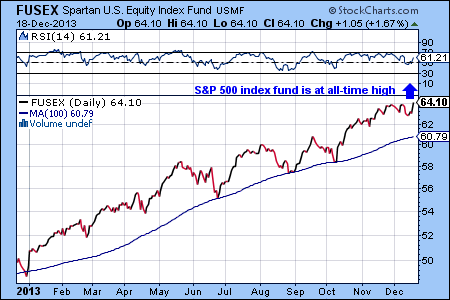 The good news is that the Fidelity Spartan 500 Index fund (FUSEX) is near its support level. If the support holds, the market can bounce back from here next week. If the support doesn’t hold, renewed selling can ensue and the panic can accelerate. The Fidelity Spartan 500 Index fund (FUSEX) is near the support level.